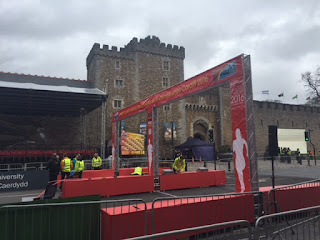 Photobrook Photography: Running the World Half Marathon Championships in Cardiff. Running the World Half Marathon Championships in Cardiff. I had absolutely no intention of entering another half marathon after I had completed my first in October 2015 The months went by and as the new year started and new year’s resolutions begun, myself and two other family members decided to enter the Plymouth half marathon that is coming up in less than two weeks’ time on April the 17th. 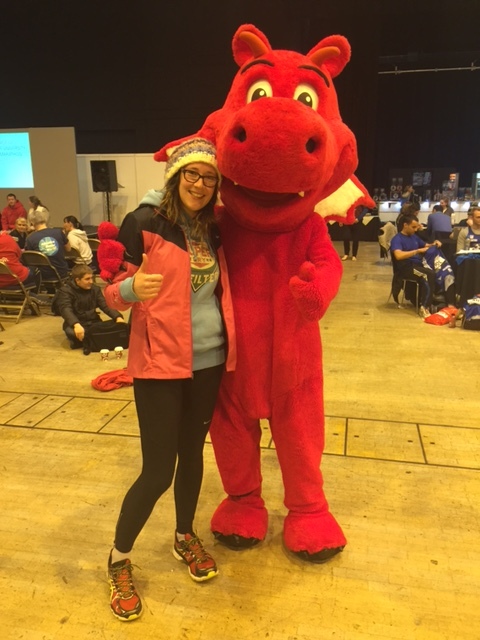 The training for the Plymouth half was going really well, I was regularly doing 8 and 9 mile runs comfortably. I had even run my second fastest Park Run and was just 11 seconds away from getting a PB and then an e-mail dropped into my inbox. 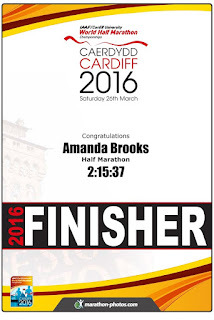 I read the e-mail and saw that they had re-opened entries to the Cardiff World Half Marathon again. I instantly dismissed the idea and closed the e-mail. 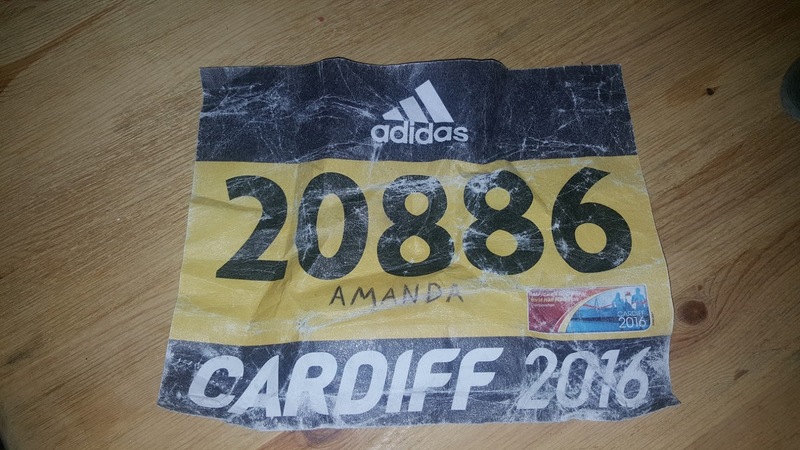 It would be crazy to do a half marathon in just 10 days’ time without any warning, or planning or training... Well I was training and I was feeling strong but that was for a run in 4 weeks’ time! Not in just 10 days! The World Half Marathon landed on Easter weekend so even if I did enter I could have two full days on the sofa to recover, if needed.... After not too much thought and just 10 days before the event I found myself re-opening the e-mail and signing up to the event. A few days later I thought I would take a quick look at the weather to start thinking about what kit needed washing in preparation to take. AND THEN, like a slap in the face it dawned on me. I was not only running a half marathon in a few days but I was potentially now going to be running a half marathon in a predicted severe weather warning. It was bad enough having gale force winds predicted but torrential rain too, that was just so unfair and I was soon wishing I had checked the 10 day forecast before signing up. This was only going to be my second half marathon and I hadn't yet endured a very wet run! I had done a fair few soggy Park Runs but that was only 30 minutes in the wet. I've often achieved a run in Cornish mizzle and more frequently a run in gale force winds but usually although really windy most were still dry and never more than an hour out on the roads. It was dawning on me that I needed to do some research on what exactly to wear to run for over two hours in the worst weather imaginable! After reading a few blog posts and articles I was starting to get into a slight panic and was reading horror stories of needing to Vaseline all toes to stop multiple toe blistering. Vaseline, basically was the suggestion for everywhere as once clothes were wet and heavy things would rub more than before. In a slight panic I resorted to asking the trusty community of Newquay Road Runners who advised me that it would never be that bad and to wear a bin bag on the start line to stay as dry as possible and to just go out there and enjoy the event regardless of the rain. They suggested a few clothing options and I was armed with slightly less scary advice on how to overcome my first very wet half marathon. 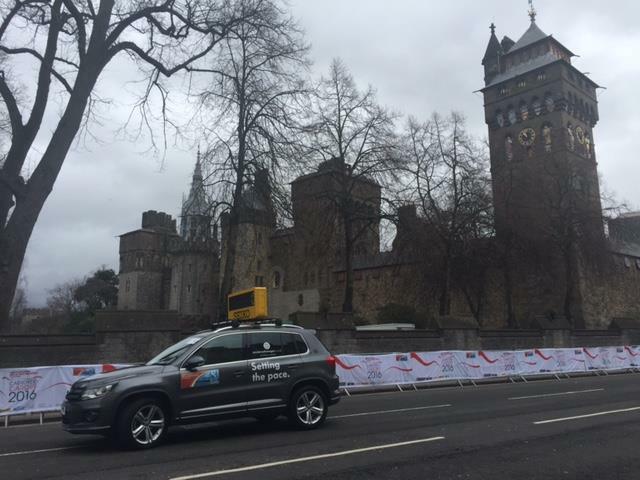 Good Friday arrived, it was the day before the run and so I found myself in the car heading on the roads up to Cardiff. The day couldn't have been any more beautiful, clear crisp blue skies, the warmth of the spring sunshine yet unfortunately I was joined by thousands of other cars on the roads also attempting an Easter getaway. We got stuck in traffic on the A30 leaving Cornwall, stuck again on the M4 after Bristol, Stuck again before the tolls on the Severn Bridge and again the other side. A journey that should have taken just over three hours was clocking in nearer to five hours. 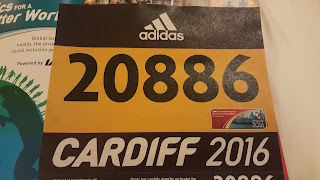 We had spent the majority of this gorgeous sunny day on the motorway and was arriving into Cardiff with just enough time to make it to the conference centre to collect my race number. With Race number in hand and feeling slightly drained we headed straight for the hotel for food and rest before the event the following day. Due to being a World event, the race wouldn't start until 2pm due to being televised all over the world so I managed a nice leisurely start to the day. Leaving the hotel late morning and taking a drive to the city centre it was dry and it was forecast dry right up until 2pm when rumour had it, it would then chuck it down. Feeling optimistic we walked the 1 mile into the city centre from the park and walk car park and headed straight to the conference centre. We spent several hours in the conference centre amongst many other runners. There were people stretching, foam rolling, jumping about, eating, sleeping, the atmosphere was pretty intense as everyone muddled through the morning waiting for the event to start. As the time got closer we headed to the race start and found the massive queue for the portaloos and it was there and then in that queue that the rain started to make its appearance. This was just typical, this could only be described as 'The law of sod' I left my partner and started making my way into the allocated pens. I was in the 'Everything else' category over 2 hours 15 minutes. I was given a plastic poncho in the conference earlier that day and had put this on in the toilet queue as the rain began to fall and was feeling confident that the rain wouldn't come to much, it had been dry pretty much all morning with only a few light showers. The race then started, we had stood in our pens whilst the starting ceremony got underway and the elite race started. We started to shuffle forwards as each of the pens was released. Everyone else started discarding their plastic ponchos and so I decided it was time I did the same. I tore and ripped my plastic poncho off and tossed it away to the side over the crowd. 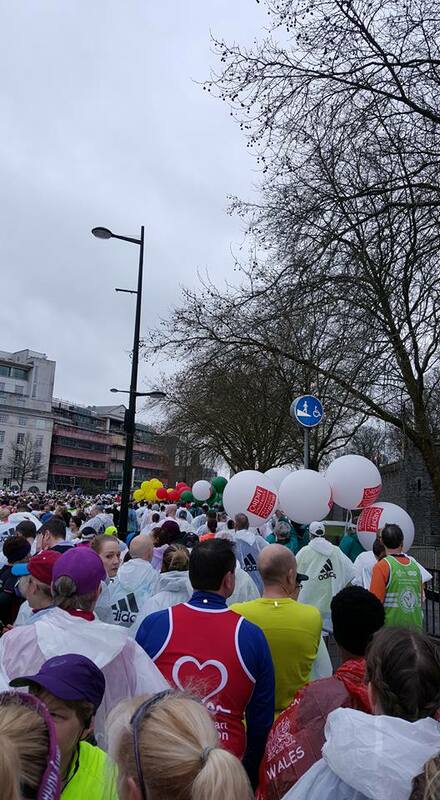 There were bin bags, bottles, old t-shirts being thrown into the sky and we slowly shuffled forwards again as the next lot of runners got underway. And then arrived the first downpour, we hadn't even got through the start line and the first heavy rain shower hit us. We had literally just removed our waterproof poncho layers as the cold hailstone filled rain gave us a brief soaking. Things were muttered between runners and people were grumbling and moaning about being cold and wet but with my lightweight running jacket I figured I was well prepared and didn't really want to run in the poncho especially in the strong winds that were blowing up. We were off, we passed under the start funnel and began running. I started to get warm and as I approached mile 2 was warm and dry enough to tie my running jacket around my waist. Things weren't so bad after all, it was a little drizzly and blowy but not too bad and so I started to relax and enjoy the run. Although the weather had other ideas and the light rain started to get a little harder again. I decided to throw the jacket back on but leave it undone so that I would get too warm. I passed through mile 3 and the drinks station and grabbed a bottle of water and things were going well. Then came the monsoon, or was it a biblical or even apocalyptic downpour? It was just horrendous, I was approaching mile 4 and the heavens literally fell out of the sky. 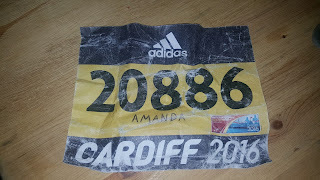 I had my bottle of water in my hands without a lid on and I couldn't quite do my jacket up and tried to clasp the jacket together the best I could and tried to keep my head down and battle on through but it was the worst rain I'd ever experienced. 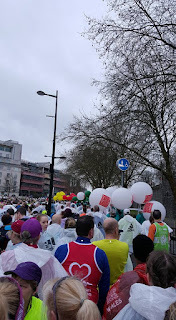 The roads started to swell with running water at the edges, the spectators, many wearing full wet weather clothing with umbrellas started running for cover and one runner shouted "IS THAT THE BEST YOU'VE GOT" and it just poured down. The rain drops were massive, I can only describe it as a bucket of water being chucked over me and everyone else. I kept going and started to get jealous of those runners still with their ponchos on. I then started to feel my feet getting very wet and they began to sound squelchy and heavy. Luckily the torrential rain didn't last more than a few minutes but it had managed to soak me completely through every layer even to my pants! I was then approaching the marina and the barrage and I could see the sign for mile 5. As I crossed the dividing footpath between the marina and the sea the wind cut across making me feel even colder in my soaking wet clothes. I saw a bin and ditched my water bottle and finally zipped my coat back up. Although already soaked I hoped it might at least shelter some of the wind. Mile 6 went through fairly quickly and with another water station and shouts and cheers of support it wasn't feeling as bad as 2 miles previous where I was on the verge of laughing and crying through the rain. After mile 6 we climbed over a dual carriageway and back towards the city centre, mile 7 was reached on a lonely stretch of road. Heading back into the city centre the crowds were back and moral was lifted and I was soon flying through mile 8, 9 and eventually to the dog leg section of mile 10 around the lake. I looked across the lake to see all those other runners much closer to finishing and felt strong and happy that it wasn't raining and I was literally 30 minutes from finishing. But then the worst thing happened, I approached mile 12 and got a sudden, sharp, shooting pain in my foot. I literally ground to a halt, I stopped in agony and then gave my foot a wiggle and it kind of felt ok so I walked it off. The only way I can describe the pain was like treading on an upturned needle. A piercing pain straight up through my foot. After walking for a few minutes and passing mile 12 I knew I couldn't walk the last mile and picked up the pace back to a light jog and managed to finish the run in a very respectable 2 hours 15 minutes and 37 seconds. I was over the moon with my time having done it 5 months previously in 2 hours 23 minutes. I had managed to knock 8 minutes of my previous attempt. I walked through the finish funnel, collected my medal, T-shirt, water and banana and started to feel a bit achy. But at this point had completely forgotten about that weird odd foot pain. My right groin was twinging when walking and so was my right glute. I headed to the massage tent and had a massage and did the best to get out of my wet clothes and left the massage tent feeling relaxed and slightly warmer. Grabbed a hot drink jumped in a taxi and headed back to the car and onto our journey home to Cornwall. Sadly the following day when I woke up I couldn't put any weight on my foot. I couldn't work out what it was that I had done. As the days went past I was able to put more and more weight on the foot but it was still sending shooting pain through my ankle and foot. I managed to get an emergency appointment with my physio who at first couldn't work out what I had done but soon suggested that it was a pain brought on by the mechanics of my foot being out of line and the constant use over 13.1 miles had left a particular ligament with trauma and that was causing the pain. He strapped up my foot into a better alignment and I returned to see him after 48 hours and it was feeling much, much better. I was getting an occasional twinge but nothing at all like it was previously. 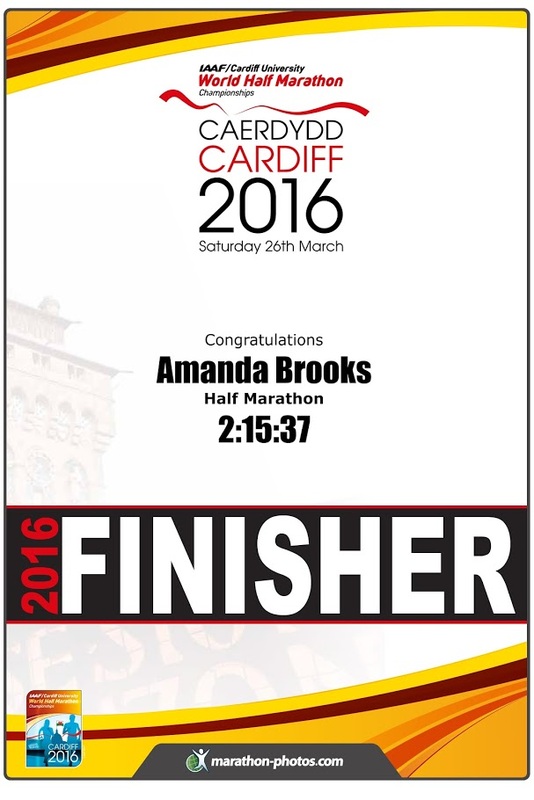 Things are feeling a lot better but I still haven't since the Cardiff Half. I'm hoping to try a little run this week whilst still taped up and fingers crossed if everything behaves itself I might be able to complete the Plymouth Half in less than two weeks’ time!! !